Qixingyan, literally 'Seven Star Rock', lies off the coast of Pingtung County, Taiwan, in the Bashi Channel. 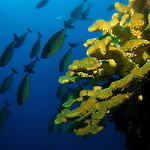 It is an area at sea composed of seven coral reefs. At low tide the seven reefs are visible, whereas at high tide, only two of the reefs are visible. Qinxingyan is arranged in a shape similar to the Big Dipper, hence the name Seven Star Reef. It is located approximately 12 nautical miles (21 km) from the southernmost point of Taiwan proper, an area where the Pacific Ocean, the Taiwan Straits and the Bashi Channel meet. Due to the strong currents and shoals in the area, many ships were wrecked and lives lost in the early to mid-19th century after the Qing court opened trade between the West and China. Notable shipwrecks in the area include the 1867 U.S. merchant vessel Rover and the 1871 Japanese merchant vessel Ryukyu. Diving Qixingyan can be very dangerous due to the strong, unpredictable currents and high waves in the area. 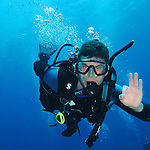 It is generally only possible to dive there in May/June, as currents and sea conditions are more favorable then. Most off the wrecks lie at depths beyond the reach of recreational SCUBA diving, with the exception of one or two small fishing boat wrecks. Often, big pelagic fish, including sharks, congregate in the area. Scuba divers are advised to listen to the local captain's advice. In recent years, there have been two incidents of divers being swept away by the strong northward-bound currents. In one case, the SCUBA divers were adrift at sea for some 72 hours(!). After a last-ditch, 13-km swim to shore by their dive guide, the group was located and picked up by the Taiwanese coast guard near Taimali on Taiwan's east coast, some 100 km away from their entry point! In the other incident only some members of the group could be saved, while others were never found again. Carrying redundant diver safety devices such as SMBs, dive lights/flashes, reflective mirrors, whistles, dye packs, buddy lines, etc., is an absolute must on these dives!